It's officially winter now. Snow is clinging to the trees. The short walk to my car is a bit treacherous with icy patches. Wind whistles around the house and pushes its way through the cracks in my old, leaky windows. And when I approach the kitchen each evening, soup is often my first thought. Alas, my husband is not as much a lover of soups as I am. However, over the three and a half years we've been married, I've been slowly bringing him around by concocting soups that cause the memories of canned soups to fade away. While I won't serve soup every single night, I make sure it gets a good rotation in our dinners. Health and added veggies and fruits are often top priority at the start of the new year. We all want to make changes and somehow the turning of the calendar year creates a perfect clean slate opportunity. Broccoli Cheddar Soup might not come to mind as a thoroughly healthful soup, but when Food Network's Ellie Krieger is the brains behind the recipe, it's bound to be a lightened up version. This soup takes just a bit longer as you make a simple cheese sauce to add to the soup, but it's definitely worth the effort. For a quicker prep, I used frozen broccoli florets. Heat the oil in a soup pot over medium heat. Add the onion and cook, stirring, until softened and translucent, about 4 minutes. Add the garlic and nutmeg and cook for 30 seconds. Add the broccoli and chicken broth and bring to a boil. Reduce the heat to medium low and cook until the broccoli is tender, about 5 minutes. Remove from the heat and cool slightly, about 15 minutes. Meanwhile, in a small saucepan, whisk together the milk and flour/cornstarch, until dissolved. Heat the mixture over medium-high heat, stirring constantly, and bring to a gentle boil. Reduce the heat to medium low and cook, stirring occasionally, until the mixture has thickened, about 3 minutes. Add one cup of the cheese and cook, stirring, until melted, 2 minutes more. Removed from the heat and cover to keep warm. 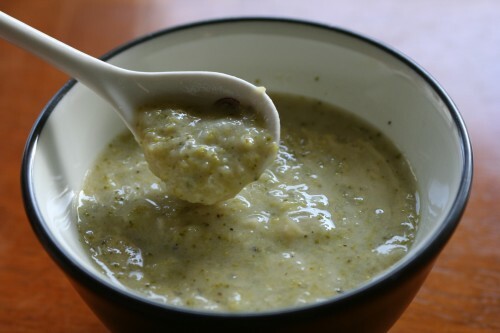 Use an immersion blender and puree the broccoli mixture, until it is mostly smooth with a few chunks. (Alternatively, if you don't have an immersion blender, puree one cup at a time in a blender.) Stir in the cheese mixture, season with salt and pepper, and cook over low heat until warmed through. Serve topped with the remaining cheese. Serves 4. Sounds good and not too difficult. I also like to eat soup during winter, plus it reheats well for a night later in the week.